Doug Bradley might be the only person who wouldn't get angry at being called "Pinhead." It's because the English actor is probably best known for his role as the Lead Cenobite "Pinhead" in the Hellraiser film series. I had crossed paths with Bradley at many previous conventions, but at Days of the Dead Louisville, I finally had a chance to meet him. He is quite the unique gentleman. First, he took pictures with fans without charging them. This might seem natural, but almost all celebrity guests charge for pictures or only give them free if you buy something else. Bradley appears at these cons to meet his fans and (obviously) to sell merchandise. We got our picture, but Liza also picked up his book, Behind the Mask of the Horror Actor. I can't really imagine just grabbibg the free selfie and not paying something. Despite being a frequent convention guest, Bradley always has a line of fans waiting to meet him. When you play an iconic character that can be expected. When you are a class act and fan-friendly, it only adds to the experience. Thank you Mr. Bradley and thanks to Days for bringing in quality guests. 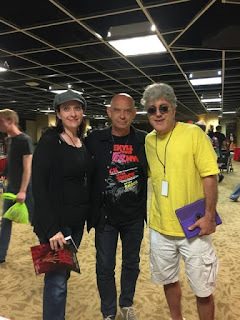 Liza, Doug Bradley and me in Louisville, KY-September 2016.